[pandatherapy] guess Wu is two?! 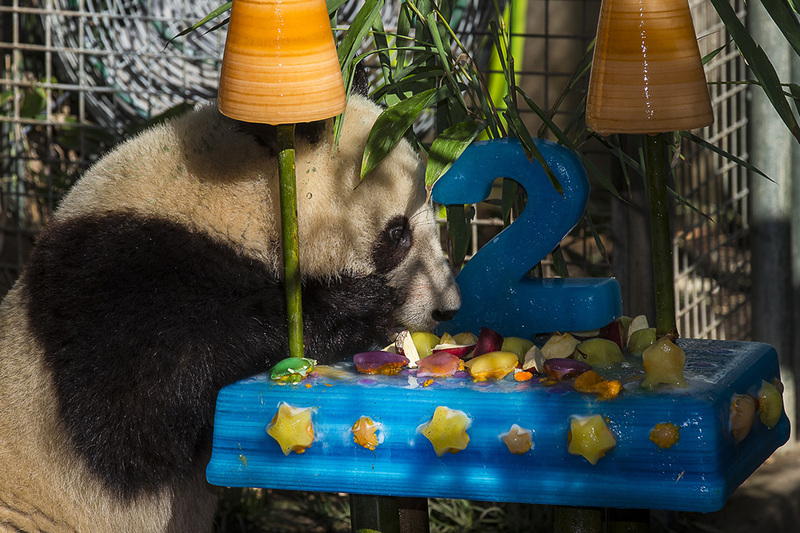 San Diego Zoo’s Xiao Li Wu turned two years old last week and I’m such a bad, irresponsible adoptive mom (one of his many anyway) that I failed to post about him on his birthday on July 29. I got into the panda fandom shortly after Xiao Liwu was born and in panda fan lingo, yes, he was my first panda cub. I used to watch the live panda cam in the afternoon when the black and white bears are just waking up in California. I learned a lot about pandas through him and until now, I am still fascinated by their specie. Wuwu is most probably the last cub of Bai Yun and Gao Gao so indeed, as his name suggests, he is such a little gift–though now, not so little anymore. In two years or so, Wuwu will return to China, where his parents come from. It is hoped that pandas like him will be able to contribute to the conservation of giant pandas just like how his parents did. You can adopt pandas at the San Diego Zoo here.